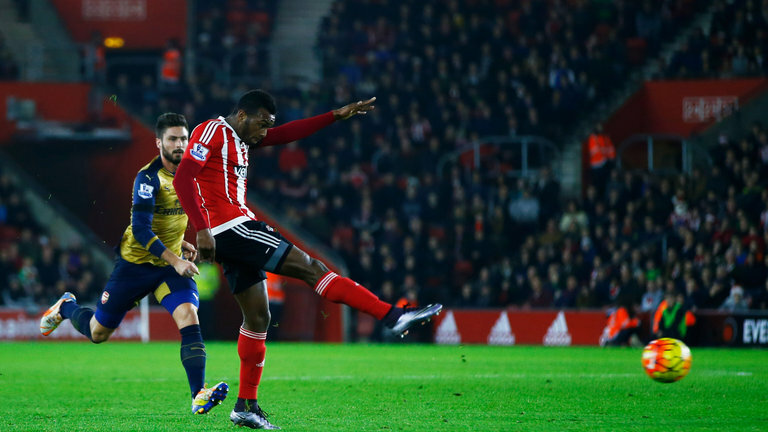 Arsenal blew the chance to go top of the Premier League as Southampton ran out impressive 4-0 winners at St Mary's. Saints took the lead through the unlikely source of Cuco Martina, who was starting his first Premier League game for the hosts, after the defender found the corner of the goal with a superb long-range half-volley. Shane Long added a second from close range in controversial fashion after Arsenal claimed he had fouled Laurent Koscielny in the build-up, before Jose Fonte headed home Southampton's third from a corner. Long got the better of the Arsenal defence again in stoppage time, driving the ball under Petr Cech's legs for 4-0. The result leaves Arsenal two points off leaders Leicester, while Saints stay 12th after their first win since November 7.